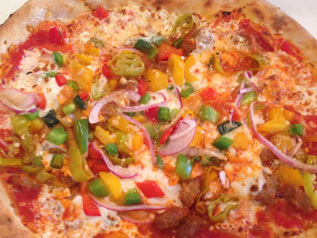 At Pompeii Pizzeria we pride ourselves on the unique and authentic flavor of our many pizzas and salads. Take a look at our menu below, or download our menu for later. Spring mix tossed with, corn, clack beans, chicken, feta, parmesan cheese, mozzarella cheese tossed in a creamy southwest dressing. Spinach tossed with peaches, feta cheese, parmesan cheese, tossed with a honey Dijon dressing. Slices of mozzarella cheese, Slices of green tomatoes, basil, topped with sea salt olive oil and balsamic dressing. 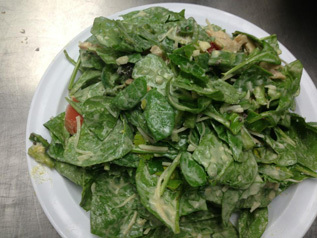 Spinach, feta, tomatoes, artichoke hearts, chicken & gorgonzola cheese in a gorgonzola dressing. Italian fig spread, feta cheese, mixed greens, prosciutto and fresh mozzarella. Salami, pepperoni, tomatoes, fresh mozzarella cheese, mixed greens, & pesto sauce. Our MARGHERITA style Neapolitan pizzas are made with fresh mozzarella, Sicilian olive oil, parmesan cheese, sea salt, tomato sauce and fresh basil. Our Classic style Neapolitan pizzas are made with fresh mozzarella, Sicilian olive oil, parmesan cheese, sea salt, tomato sauce and oregano. Our White Sauce Neapolitan pizzas are made with fresh mozzarella, Sicilian olive oil, parmesan cheese, sea salt and créme fraiche. Crème fraiche, goat cheese, spinach, oregano, topped with a fresh mixed green salad with prosciutto and balsamic dressing. Italian Fig spread topped with Italian Seasoning, feta cheese, prosciutto, mozzarella & parmesan cheese. Crème Fraiche basil, gorgonzola cheese, goat cheese, diced red & green tomatoes, mozzarella cheese, parmesan cheese. Classic red sauce, black beans, corn, cilantro, garlic, chicken, mozzarella cheese topped with parmesan cheese. 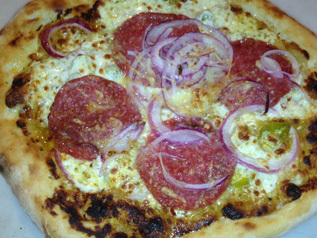 Crème Fraiche Fraiche topped with Italian seasoning, goat cheese, prosciutto, onions, mozzarella, parmesan cheese. Then after its cooked topped with Truffle Glaze. Creamy Dijon base, topped with cracked red pepper, pulled pork, prosciutto, onions, mozzarella & parmesan cheese. Then topped with cold pickles.